Whole School Planning sounds dreary, but I had a slightly transcendent experience of how it can be done in a really well led school when I went to Oakley last week, an ancient but scattered village best known to 20th century history as the place the Great Train Robbers hid their takings. Children at the Oakley C of E Combined School were brilliant, bubbly and tremendous fun. Questions included “Who made God?” and “how did Jesus come to life again?” as well as the usual ones about Max the Cat and our children. This school is, humanly speaking, an ideal size of about 100. Everybody really knows everybody else and it feels as though people really do muck in together here to get the best out of each other. 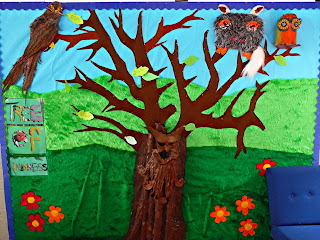 The school is wonderfully well in with the village, both historically, and in creative contemporary ways. I noticed the school had arranged with builders of some new houses locally for small groups of children to go and visit regularly and see how houses are built — brilliant! I’d love to have done that when I was 8/9/10! I was impressed by the Christian learning going on. 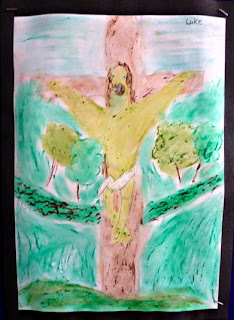 Year 5 children had been working on Chagall images of the Crucifixion, producing their own, countering the tendency in lesser schools to telescope holy week into an Easter Bunny thang. 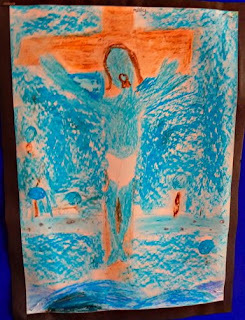 The School Council has also been working and consulting on a school prayer for everyone, and there has been really good sustained work to build children’s environmental awarenss in an Eco-school. David Kaboleh, local Vicar, is a frequent and friendly visitor. 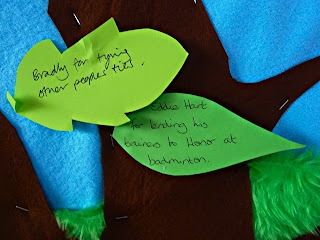 I liked the kindness tree where various good deeds were recorded, shared and celebrated as leaves on a tree. 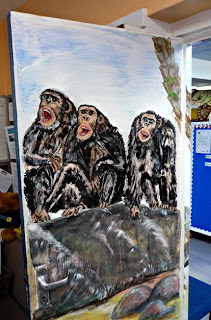 I did see something I’ve not seen before, however, behind the Staff room door, with its elegant Simian theme. 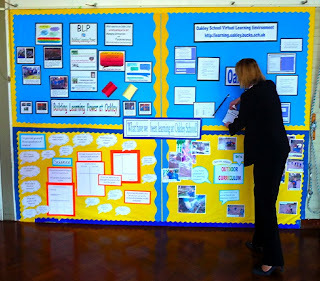 Jo Garlick and colleagues work closely together, to deliver their school improvement plan. There’s nothing crypto about learning strategy — it's there for everyone to see in the hall. But the staff have a mini version of the School Improvement Plan on the staff room wall. 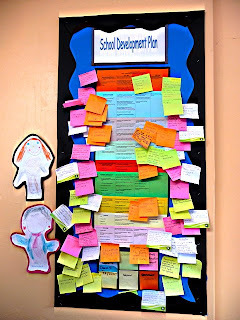 People, including children, use post-its when they undertake work, different colours for different groups (children, staff, governors, parents) and stick them into the whole scheme of what’s going on. By doing this everybody can relate what they’re doing in the here and now to the broader strategy. Everybody can see that they’re part of the whole work of the school, and how. Everybody can see where the gaps are, in any given term. This may sound like some boring bureaucratic thing, but it’s a brilliantly simple idea, that might be effective in all sorts of places (Churches? ), and it really seems to work. It shows you can tie everything together strategically without being heavy handed, to keep things moving forward in a really deightful but also highly effective small school. Thanks +Alan for a very enlightening & encouraging post. My two children attend a CofE primary which seems very similar and I am privileged to be Vice-chair of Govs. 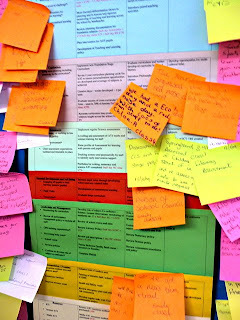 Although we are as open as possible about the SIP I think the idea of the post-its is genius and I will be taking it back to our Head, staff and Govs. It is really important to get the good news of what is going on in our church schools out there to counteract the very negative and often biased news stories and so called independent reports. These schools are something the CofE can be justly proud of and we should celebrate their comtribution to the community and nation not apologise for them. 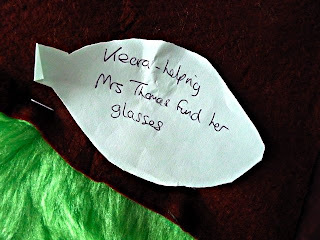 A great post; it's so good to share good practice in CofE schools. 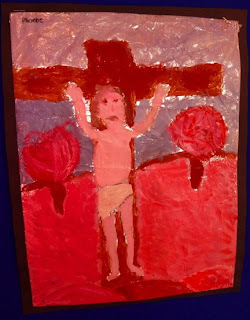 I am privileged to be Chair of Governors of our parish school, and I have already passed it on to our head and the Rector (vice-chair); unfortunately, the Local Authority have blocked your blog, for some reason! 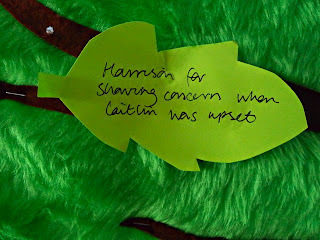 We have a diocesan governors training event next Saturday and I will pass it on to our Schools Support Officer as an example of best practice. 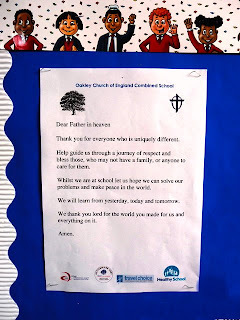 Thank you for both previous comments and to Bishop Alan for his recent blog post following his inspiring visit to our school - I am the headteacher of Oakley CE Combined School and I can assuure you that monitoring and contributing to the SIP in this very simple way really does make the whole, potentially arduos, task very much simpler and empowers all stakeholders to contribute and take ownership. Thanks for the uplifting and affirming message about the good work at Oakley. 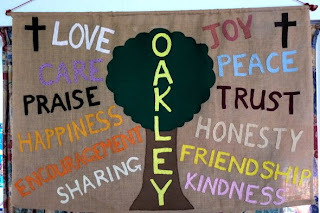 As the Local Authority we reflect on the hard work and inspirational teaching that goes on in many of our schools and it is good to see that schools, such as Oakley, still have the energy and pasion to inspire. I know that Jo and all her team will have gained much from your visit and will enjoy the positive comments that you made.